Three Jews and a shiksa gather after a funeral. Sounds like the set up for a bad joke but instead it’s the set up for Joshua Harmon’s fantastic new play, Bad Jews. At rise, Jonah Harber (Philip Ettinger) is playing a video game. His cousin, Daphna Feygenbaum (Tracee Chimo), soon emerges from the bathroom and begins talking about Poppy, Jonah and Daphna’s dearly and recently departed grandfather. They are awaiting the arrival of Jonah’s brother, Liam (Michael Zegen), and Liam’s non-Jewish girlfriend, Melody (Molly Ranson), who have missed Poppy’s funeral but are nevertheless cutting short their ski vacation to be with the family. Daphna feels entitled to Poppy’s chai, which has particular familial and Jewish significance, and is about to be abruptly clued into the fact that Liam has the chai and intends to give it to Melody. Arguments (and some hilarity) ensue. I hope that doesn’t make Bad Jews sound like a bunch of people senselessly complaining. It isn’t. Instead, it’s an exhaustively thoughtful, incredibly well-observed and sharply written play about family and identity. Taking place in real time in the Upper West Side studio apartment Jonah and Liam’s parents bought as a spare crash pad (designed for the stage by Lauren Helpern), layered family dynamics reveal themselves in real time (about 100 minutes). Harmon and director Daniel Aukin fill the play with numerous little moments that add to the play’s verisimilitude. (For instance, during one of his rants, Liam continually takes out or unwraps food he never eats because he’s too busy making his point. Or, there’s the moment when the three cousins are retelling a family story and burst out in uncontrollable laughter, laughing so hard they cannot finish telling the story.) It’s all those little things—the actions, the quiet asides, the comments you would only make about family behind their backs—that make Bad Jews instantly relatable. While whatever plot there is concerns Poppy’s chai, mostly Bad Jews is a character study, delving most deeply into Daphna and Liam’s conflicting points of view. Daphna fully embraces Judaism (Daphna, in fact, is her Hebrew name; Liam refuses to call her this and refers to her only by her given English name, Diana) and is, as Liam might put it, rather high and mighty about her Jewishness. Before Liam arrives, she bemoans to Jonah the way Liam flaunts his rejection of Judaism, taking umbrage with the fact that Liam came, for example, to a Passover seder only to roll his eyes and declare himself a bad Jew for not participating. Liam, on the other hand, is Jewish by birth and perhaps by upbringing but that’s about it. At age 25 (all four characters are somewhere in their early twenties, with Jonah being the youngest), he eschews the culture into which he was born and is instead pursuing a PhD in Japanese youth culture. He’s had a series of non-Jewish girlfriends, including Melody, and has no palpable, every day connection to Judaism. Bad Jews (currently in its world premiere run at Roundabout Underground) becomes increasingly interesting, though, when you realize that while Daphna and Liam are on opposite ends of the spectrum regarding their religious beliefs, they are, in fact, exactly the same. They both are strong-willed neurotics who hold their beliefs with such certitude and make brightly impassioned arguments in defense of these beliefs. With stellar performances from all four young actors, these fiery debates are intensely transfixing. Philip Ettinger brings a familiar anxiousness to wannabe peacemaker Jonah. Molly Ranson (Jerusalem) uncovers layers in the seemingly simple Melody. But it’s Tracee Chimo (Circle MirrorTransformation, Bachelorette) and Michael Zegen (TV’s Boardwalk Empire) who are explosive as Daphna and Liam throw verbal and emotional haymakers while attempting to win the bout. Bad Jews is, without exaggeration, one of the best new plays I’ve seen all year. The writing is unflinching, smart and honest, and so are the performances. 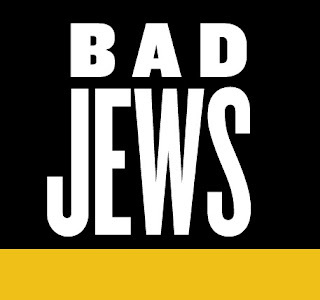 Be a good theatergoer and see Bad Jews. Update: Since its glorious and extended run at Roundabout Underground in fall 2012, Bad Jews has moved upstairs to Roundabout's off-Broadway mainstage. (It is the first Underground show to make this leap.) I had the joy of seeing the "above ground" production in fall 2013, and I'm pleased to report that nothing was lost in the move. The sharp writing and unflinching insight is still there, as are the top-notch performances from all four actors. The theatre itself is significantly bigger than the tiny, underground black box theatre in which it premiered, and so the audience wasn't quite as "in it" with the bad Jews as before, but scenic designer Lauren Helpern frames the playing space so that it is still cramped, trapping Jonah, Daphna, Liam and Melody in the studio with no room to hide. Bravo!